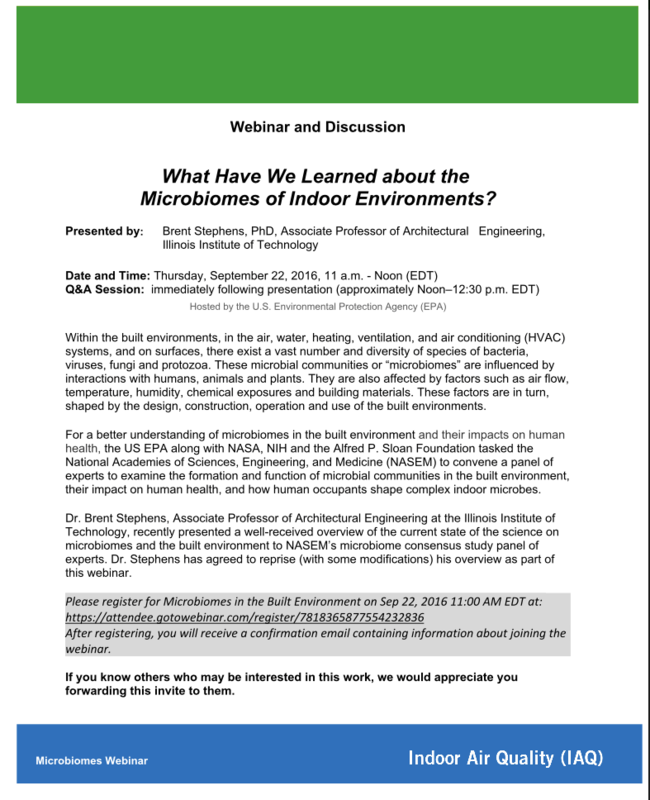 home .Featured, Information and Resources, Meetings and Talks EPA Webinar and Discussion: What Have We Learned about the Microbiomes of Indoor Environments? Paula Olsiewski just pointed us to this upcoming webinar and discussion hosted by Brent Stephens. This presumably relates closely to his article on the same topic which is a must-read. Within the built environments, in the air, water, heating, ventilation, and air conditioning (HVAC) systems, and on surfaces, there exist a vast number and diversity of species of bacteria, viruses, fungi and protozoa. These microbial communities or “microbiomes” are influenced by interactions with humans, animals and plants. They are also affected by factors such as air flow, temperature, humidity, chemical exposures and building materials. These factors are in turn, shaped by the design, construction, operation and use of the built environments. Dr. Brent Stephens, Associate Professor of Architectural Engineering at the Illinois Institute of Technology, presented a well-received overview of the current state of the science on microbiomes and the built environment to NAS’s microbiome consensus study panel of experts. Dr. Stephens has agreed to reprise (with some modifications) his overview as part of this webinar.